After I posted about all of the clever uses for tension rods, Ashley reminded me of this one from Martha Stewart that I LOVE! I actually have this pinned on one of my boards over on Pinterest. 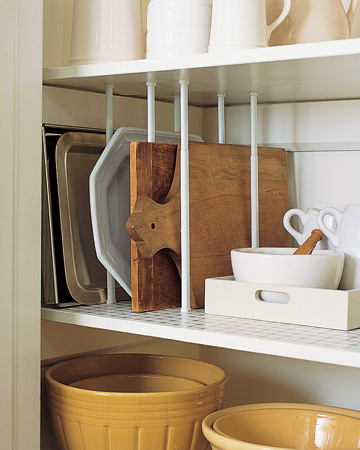 Tension rods as shelf dividers in your pantry! Clever! You can see the rest of the tension curtain rod ideas HERE. I love this! On Apartment Therapy the other day, they posted another great idea: use a tension rod under the kitchen sink to hang spray bottles. Both of these ideas are "Why didn't I think of that" ideas! Really small space friendly. Thanks for the idea.